If you were excited to learn Branson would become the home of the popular Navy Pier Ferris Wheel (from Chicago) in 2016, you’ll be downright pumped about another big arrival. A towering attraction dubbed Bigfoot will come to the 76 Country Boulevard Strip in the summer of 2016, offering adventure seekers – and folks who simply want to take in commanding views of the Ozarks – another attraction to enjoy in Branson. 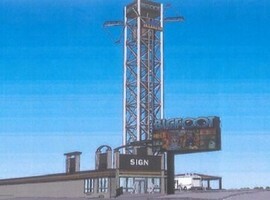 Bigfoot will be located across from the World’s Largest Toy Museum and White Water on the 76 Strip. Other nearby attractions are the Tracks Family Fun Parks Track 5, Branson Military Museum and Xtreme Racing Center. • A drop ride that takes riders 200 feet into the air before they begin a free fall back down toward the ground. • A saddle swing ride that launches riders (two at a time) 200 feet up before they are released and begin flipping end-over-end as they return toward the ground. • An enclosed viewing ride that spins (slowly) on the way up, and down, as it provides guests with 360-degree views of the 76 Strip. An opening date for Bigfoot has not yet been announced.